Your new album Rubicon (Napalm Records) was released 2 months ago - how are the reactions about it? The reactions are really good. Actually I found out that many people are buying our CD and everybody feel interest in the new style of Tristania. We are getting new fans - people that was not interested in Tristania before because of the different style. Also the interest from many of the old fans for the band is alive. So we are really happy. How important are the new medias like Twitter, MySpace for the band; to get contact there with the fans and to hear what they say? It´s really important and we must be very good in keeping it alive. The more you are close to the fans and keep in contact with them, the more they are interested in getting to know about your music and what you´re doing. Also they don´t feel that far from you. I think it´s a nice thing. Of course the networking is always very important and it´s extremely important nowadays. Do you write songs in teamwork or write just a few from the band members? Everybody writes. We actually work everybody on its own parts and we just fight to mix it in the song in its end. What I mean is: if Anders or Ole or Einar comes out with some riffs or ideas, everybody choose its kind of space into the making of the song. For example: I try to write some vocal lines which feature the songs. You have to capture all the emotions and all the feelings that someone else want to express by this music. So everybody writes - that´s what happened on Rubicon as well. Everybody had its own part or its own role on it. This evening is the 11th show of your European tour. You played 2 shows in Norway with special guests, also Silje Wergeland of the Dutch band The Gathering. Will that happen more often in the future and also in other countries? We wanted to bring Silje on stage because we know her already. She´s been playing with our guitarist Gyri before in her previous band Octavia Sperati. Pete is been playing with Tristania sometimes before and on the previous albums. So we knew both already. Maybe we can think about some other guests who can catch during this tour. But at the moment it isn´t something that we are planning... If it happens and we have the opportunity, we do it. Later this month you will play at MFVF in Belgium. 4 Years ago you played there for the last time . Are you excited about it? I´m very excited about that but I never played there before. For you it´s the first time... and for the other members of the band? For me and many of them it is the first time. We changed so many members... not everybody was participated to the MFVF 4 years ago. I think, just 2 of them, Anders and Tarald. But for me it´s new and yes I´m excited but of course every gig has its own excitement. Will you play a special show there or is it a secret what will happen? No, probably will be a bit special effects on the shows. But at the moment I can´t say that much. Are there plans to make a DVD or live CD soon in the near future? Yes, because me and Kjetil joined the band. The vocal style is also changed because I´m not an opera singer and I will never be an opera singer. I was born with singing Blues, Soul and Rock. That´s the way and I don´t know if people guess it. Many people think that Blues it´s a way out to... I don´t know, to play around with notes, something like that. I think it´s very important to see the way I approach Tristania. Tristania comes from Gothic, there is some gloomy feeling and the sadness of the Gothic mentality is always been there. It´s not far from the melancholy of Blues.... if people know that Blues is lot of melancholy. So I´ve never seen any hard job in the way I fight to approach Tristania for that. To what band would Tristania never say no if they ask you to be support act? They would never say no to The Cure maybe. I would never say no for example to Mars Volta or Porcupine Tree, it´s my fave. There are many good bands we would be happy to tour with, also Lacuna Coil or Epica as well. Bands that are already at a high level and all bands that work really hard. Is there anything I haven´t ask you and you want to add it into the interview? I want to let all the fans know about my passion for the music and Tristania, that I really work hard for bringing Tristania to the next level and to keep this personality. 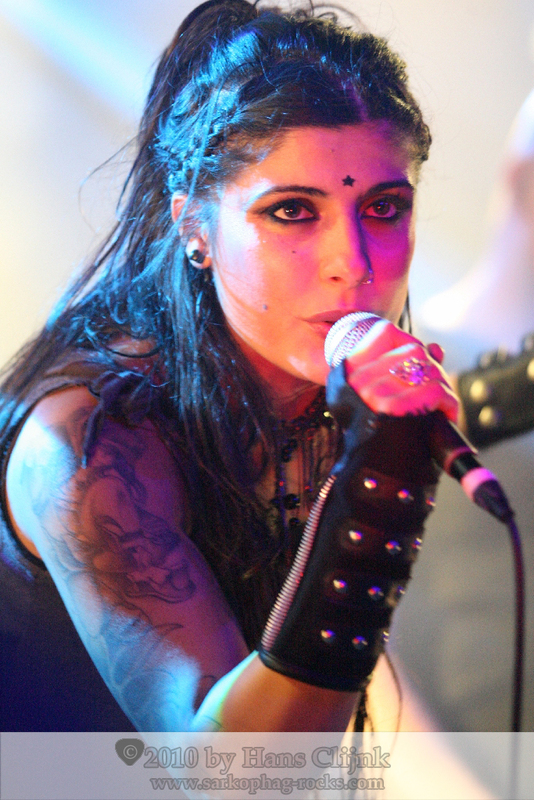 I think Tristania has now catch a style when lot of personality is expressed and all the members represent something. So it´s not just about two or three people but everybody - this is a band. That I want them to know.